A WS made to help students deepen their analysis when studying a scene from a film. Students learn the names and goals of the main shots used in films and are then able to comment upon the idea conveyed by the choices the film-maker made to enhance his point of view. 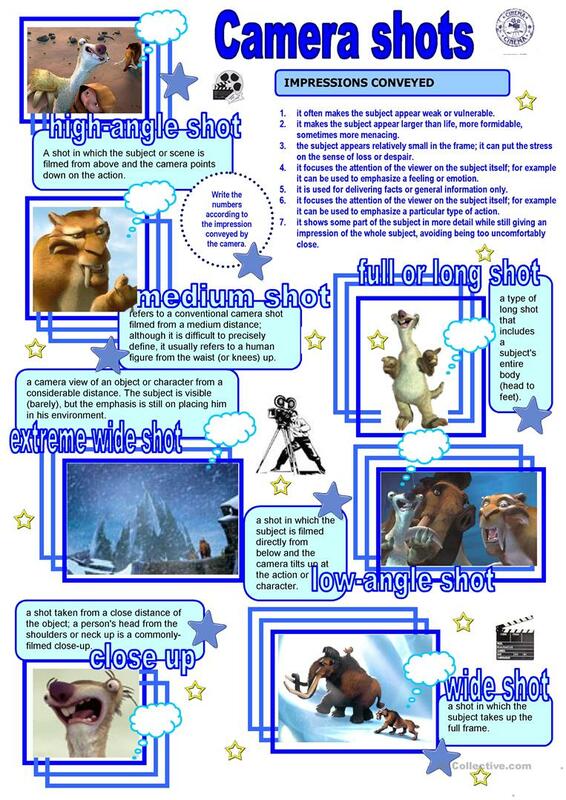 There is a short description of each shot, which students have to link with the effect it has on the viewer. This downloadable worksheet is intended for high school students, elementary school students and adults at Intermediate (B1), Upper-intermediate (B2), Advanced (C1) and Proficient (C2) level. It was designed for honing your class' Speaking and Writing skills. It is focused on the topic and words of Hobbies. firstime is from/lives in France and has been a member of iSLCollective since 2011-02-28 00:14:52. firstime last logged in on 2017-10-22 17:29:52, and has shared 2 resources on iSLCollective so far.